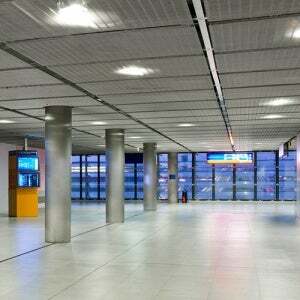 The ceiling panels with architectural mesh at Satellit S3 at the Charles de Gaulle Airport, Paris, France. The new construction of Satellite S3 was fitted with ceiling panels made from HAVER weave type DOGLA-TRIO 1010. The Charles de Gaulle Airport in Paris is the most important airport in France. With more than 58 million passengers passing through each year, it is one of the largest transit airports in Europe. To accommodate the steadily increasing number of passengers, the airport was expanded during 2004, with the new construction of Satellit S3 finally completed in 2007. The Satellit S3 floor-plan is 750m long and 80m wide. Located east of Terminals 2E and F2, it acts as a transit area between long-distance and short-distance flights. In addition to 1,400m² of cafes and restaurants, the building also offers passengers 3,200m² of different shops. HAVER & BOECKER created an individual mesh designed to meet the very specific technical and visual requirements for this project; the mesh had to be non-combustible, durable and robust, and had to have a large open area to meet fire regulations. At the same time, the mesh needed to visually disguise the technical services above, whilse still giving easy access for maintenance purposes. The architect chose HAVER weave type DOGLA-TRIO 1010, which met all the technical and visual demands. The strength of the wire and the structure of this mesh type create a very robust specification, offering an open area of approximately 72%. The clusters of vertical warp wires give this mesh high aesthetic appeal. The overall effect is a wire mesh ceiling which creates an exclusive ambience within the Satellite S3. In total, HAVER & BOECKER supplied 19,500m² of weave type DOGLA-TRIO 1010.